Herbicide-resistant weeds have more than doubled since 2009 to infest approximately 70 million acres of American farmland –an area larger than the states of Ohio and Illinois combined. 20 years after the introduction of genetically engineered (GE) Roundup Ready corn and soybeans, more tools are needed to maintain productivity. GE crops were hailed as a major advance precisely because they did away with the need for more toxic herbicides like 2,4-D: Robert Fraley, executive vice president and chief technology officer at Monsanto, recently affirmed that "herbicide tolerant crops have been a great enabler. They've enabled farmers to use safer and more environmentally friendly chemicals and replace the products that were previously used...The benefits have been so real and so clear. As I said, it's reduced pesticide use." 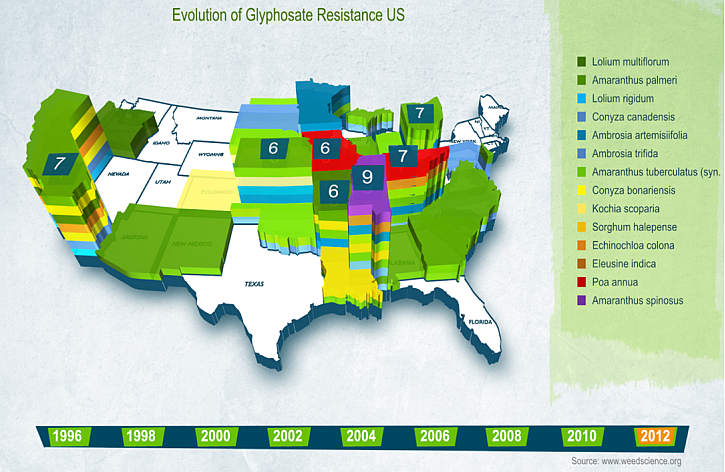 However, use of Roundup (glyphosate) steadily increased, even as more and more weeds became resistant. In 2007, as much as 185 million pounds of glyphosate was used by U.S. farmers, double the amount used six years ago, according to Environmental Protection Agency (EPA) data. 2,4-D and Dicambra are herbicides that are already used to “burn down” the weeds in the autumn, and as pre-emergent herbicides as a prophylactic in the spring, before planting. But up until now these more-toxic herbicides could not be used during the growing season, as glyphosate can on GE corn and soybeans. More tools were needed to maintain yields. Dow recently secured regulatory approval to roll out Enlist Duo in 2015, a stacked-trait GE for corn and soybean cultivars. Stacked traits have already been used to enhance herbicide-resistant Roundup Ready soybeans with Bt, a natural pesticide. There are also stacked trait soybeans that contain transgenes to produce oils that are less susceptible to rancidity, and commands a premium price on the market. The new GE crops will be resistant to both glyphosate and 2,4-D, allowing farmers to kill glyphosate-resistant weeds during the growing season. 2,4-D is a plant hormone that kills broadleaf plants (but not grasses like corn, or wheat) by overstimulating growth. In contrast, glyphosate works by inhibiting a crucial plant enzyme that is not present in animals. Both are widely used in both residential (lawns and gardening) and commercial (farm) settings. 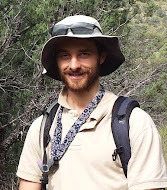 Agronomists predict that resistance to 2,4-D will develop as rapidly as resistance to glyphosate, because farmers will spur evolution by using the same herbicide on the plants in the same fields, successively selecting for anything with resistance. USDA and EPA have vowed to better manage the technology, but compliance with integrated pest management strategies is voluntary. 2,4D has been known to drift off fields and kill nearby woodlots, fruit trees, and organic crops, so Dow has changed the chemical to reduce volatility and designed special nozzles to better control application. EPA is “imposing first-time ever restrictions to manage injury to sensitive crops. The EPA has put in place restrictions to avoid pesticide drift, including a 30-foot in-field “no spray” buffer zone around the application area, no pesticide application when the wind speed is over 15 miles per hour, and only ground applications (with the special nozzles) are permited. Another first for the GE crops is that the EPA is also imposing requirements to reduce potential for developing resistant weeds, such as mandating extensive surveying and reporting to EPA and grower education and remediation plans. EPA will reevaluate after 6 years, and may impose new restrictions at that point. 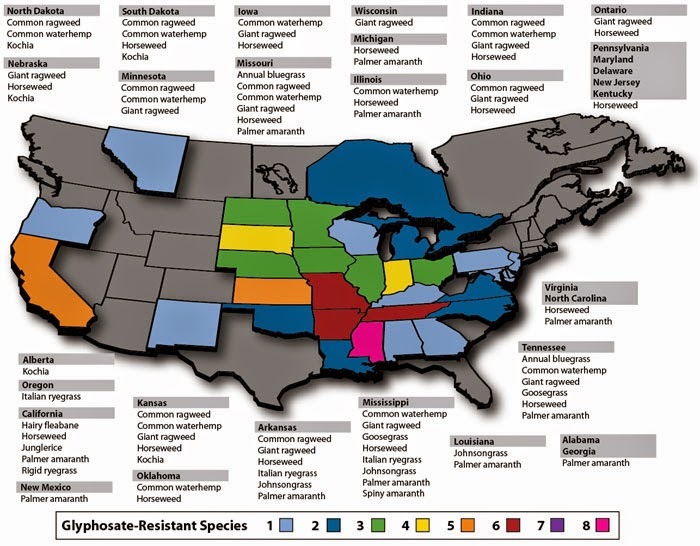 Some of the most common resistant weeds are: Marestail, Giant Ragweed, Volunteer Corn, Common Ragweed, Lambs quarter, Agronomists idenitify resistant weeds based on the fact “that most... soybeans are RoundupReady, and that if weeds are still in the soybean field at the end of the season, then there must have been a failure of the system (i.e. spraying herbicides didn’t control them)."